Hold on guys. This pictures was send to us from an unknown source. So please don’t take this picture to serious. 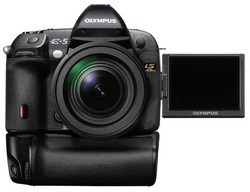 We believe the Olympus E-5 will probably be launched the third quarter this year. I ask the anonymus sender to send us a bigger picture. This are hard times. Economic crisis scares people. Nobody knows how it is going to end. I work for a private company and we feel it is harder to get money form clients. But we also feel economic crisis could bring some positive side-effect. Sometimes crisis accelerate innovation. For example Linxudistributions are getting more popular in this times. People who normally acts really conservative is forced to change and try new ways to keep their business. I hope we can get out as best as possible from this times. We are courious to know if you are going to change you planned investments in digital cameras stuff (bodys, lenses and accessories). Do you accept the new rumor value system? That’s a real good start for us! Only few believed us. we were right or NOT? 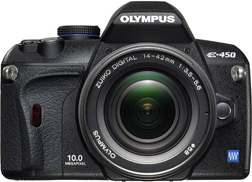 Olympus E-450!!! They anticipated the announcement by ONE day because tomorrow is fools day. Our sources were right or not? Do you believe us now?